Home > Economics help blog > economics > What Happens if Greece Leaves the Euro? 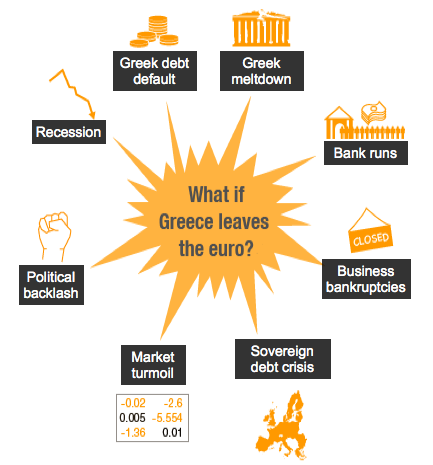 The BBC have this infographic about what happens if Greece leaves the Euro. But, when I look at this. Everything has already happened. Greece is already in recession. It has been in recession for past 5 years. The Markets are already in turmoil with bond yields very high, and stock markets falling. Greece has already partially defaulted. It already has a sovereign debt crisis. What Would be Different if Greece did leave the Euro? Devaluation of around 25-50%. This would lead to a significant rise in import prices. This would cause (imported) inflation and rising living costs. Greek goods and services would become much cheaper. It would create some very cheap Greek holidays. Capital Outflows. The biggest problem is that in lead up to devaluation, Greeks would try to withdraw money from Greece and retain the value of their Euros. These capital outflows and bank withdrawals could be very damaging to the economy. It depends on the extent to which the Government is able to restrict capital flows. But, it could cause tremendous damage to (an already battered) banking sector. Greek default. Rather than partial default, we would see a full default as Greece had insufficient funds to meet interest payments. Domestic demand could benefit. In the long-term, Greece will see an improvement in domestic demand. Demand for imports would fall due to higher cost. Greece would benefit from higher exports and (if political situation stabilises) an inflow of tourism. Greece would no longer feel it is following dictates of EU (Germany) and would have greater economic and political independence. It depends what happens in rest of Eurozone. If the rest of the Eurozone survive and see economic recovery, this would help Greece also recover. However, if the whole Eurozone fails, it would be much more difficult to develop a bigger export sector and recover. With a full default, it may be possible to end crippling spending cuts, though it would have a smaller tax base due to smaller size of economy.